Now, I know this looks messy and it is I guess, but the idea behind this was a style I had seen used before. I know that you can be 'sketchy' with pencil, but I had seen the same thing done with pen and fancied giving it a go. Seeing as the Wish art is so soft, I thought it would be a nice contrast to see it like this. This was my first try in this style and although there are some bits I'm not 100% happy with, I do like it in general. Just hope Chii does too ^^ . Browse Suki Gallery: Recent | Popular. you're a very talented artist ^_^ Great job! Thank you for sharing it ^_^ Keep up the good work!! Not bad for a first try with the pen, I think. XD But it could be a lot better with a little attention to detail. Take care to make lines join where they should (eg. teddy's eyes). Spend a little time to give fingers some real definition. Check out existing manga art (great one for hands is Obata Takeshi's Hikaru no Go XD) to see how they curve. My pen-specific advice would be.. for the outlines, you seem to be moving the pen slowly and steadily. Try tracing your pencil lines a little more quickly - it'll help your strokes look more natural and less wavy (well.. it's definitely hard, especially for the longer lines like sleeves.. but practice until it becomes easier >.<). Hm.. and. When you shade, don't stick to the outlines. Think about where the shadows will go - often they'll cut right across a figure (for eg. 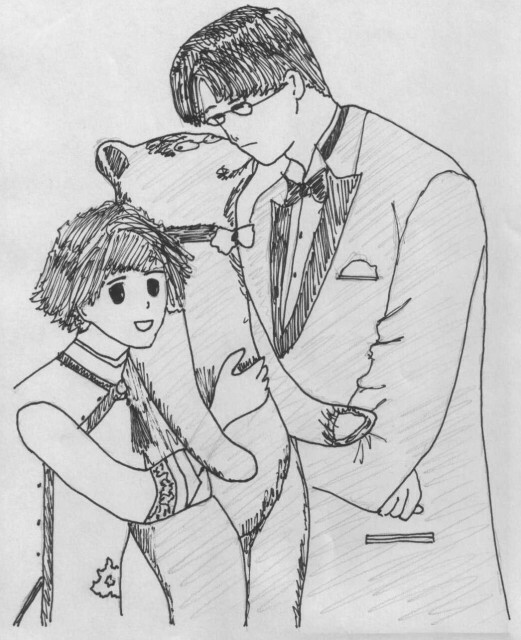 there should be some across the front of the guy's suit where the bear is. and the bear itself would have some across its face, under it's 'cheek'). Also, if you have Photoshop, try fiddling with the Levels after you've scanned the image (ctrl+L). :) It'll make the black ink solid black, and bring the grey up to the white that it should be. Not to mention help with the general appearance. XD Anything to help keep the Bot at bay, ne? Anyways! :D Ganbatte~<3 You're sure to get better. i like it. it's different and unique. i've tried working with pen too but it just turns out funky looking. hehe this looks very clean and simple. cuteness! damn~~~ it reminds me school start in 2 weeks -_-! Is that a giant teddy bear I see?! lol. Keep rockin' w/ the art. Well, I haven't seen any Wish art, but this pic doesn't look so bad. I always respect artists, because I'll never become one ^_^' . Nice pic Aa-chan. Don't give up on drawing. At glance this is a nice drawings. Although it's lacking in some element , as in shadowing . It is bold and nice in which i think the best part of the drawing. The char expression is also nice ^^. Thanks for the comment. I can't write in your guestbook for some reason, so here will do ^^ .